Tom Ryan describes himself as middle-aged, overweight and an acrophobic newspaperman. 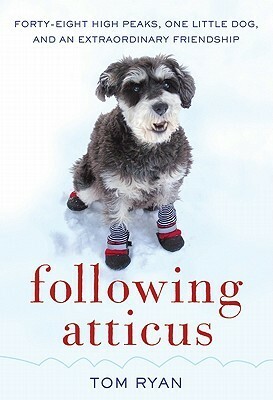 He and his canine companion, miniature schnauzer, Atticus M. Finch, are an unlikely pair of mountaineers. Tom was drawn to the New Hampshire peaks by some childhood memories. When a close friend dies of cancer he decides to climb all 48 four thousand foot peaks twice in one winter as a tribute to her and to raise money for charity. It is an adventure of a lifetime and will test both the man and the dog’s endurance. They trek miles on the dangerous trails covered in snow and ice. The weather becomes an enemy as snow and cold can keep them off the trails as they try to complete this difficult challenge. What an inspiring story!!! An incredible journey, just a man and his dog. Perseverance, determination, strength of mind and body. This 5 pound little puppy worked its way into Tom Ryan’s heart and they will both work their way into yours. I found several interesting things in the book. The first was the breeder’s advice to Tom to carry the pup wherever he went for the first month to bond with the pup. I had never heard that before but Tom and Atticus’s relationship proves how well it works. The second was the education of The White Mountains. Living in Wisconsin I didn’t know much about them at all except that they were there 🙂 After reading the book I checked out some sources online and there is a lot of information about hiking and the The Appalachian Mountain Club. After reading this book I wish I was able to hike the mountains myself. Tom Ryan changed his life and his story could change yours. Whether it be climbing actual mountains or the mountains we all face in every day life. Attitcus was like “The Little Engine That Could”, he didn’t know he was so small and he led Tom up those mountains like an animal 100 times his size. This is not a story you will soon forget. You will want to share the wonder of it with your friends and family. It receives my highest recommendation! SO want to read this… I have gotten bored with what I am reading This wee gem could Or will slap me out of it. Really who could resist WEE JOCK! You are right on with your review. Because of Tom’s willingness to share his experiences with Atticus, I have enriched my relationship with my own mini-schnauzer, Max. I know that Max appreciates our improved relationship as much as I do. Inspiring story that will never leave you.